This website is completely and utterly devoted to one of the most talented and influential actresses of our generation. From her first huge success in 'The Rocky Horror Picture Show' shes astounded audiences worldwide with her heart warming portrayals in films such as 'Stepmom' and 'The Client' and left film critics in awe of her hypnotizing performance as Sister Helen Prejean in 'Dead Man Walking' for which she won a long overdue academy award. She is able to transport audiences into another world with her devotion and natural ability whilst providing us with relatable characters that both make us fall in love with them but mostly her. Falling in love with this woman is easy as she radiates warmness and allows her maternal instincts shine through. One of the most well respected names in Hollywood today with actors and actresses aspiring to be her. Co star Geena Davis "slavishly worships" her and after thirty six years in the film industry she has a well deserved place in film history. Not only does put all her energy into her roles she continues her political work up and running proving that she will stand up for her morals unafraid of any bad press. She will draw attention to causes that have been forgotten and fight for her beliefs carefree. 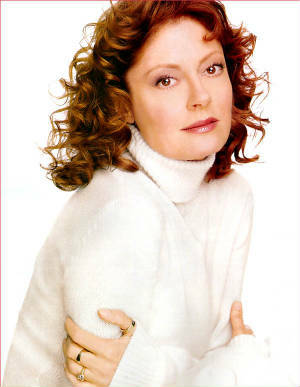 Fabulously fiesty, Incredibly intelligent, simply stunning and a Goddess of the silver screen, Susan Sarandon continues to amaze film goers globally and long may her success continue. The site has been up and running now for over two years and now attracts over 5000 visitors a month. The site contains news that is updated regularly, a gallery, multimedia clips, wallpapers, quizzes, a biography, filmography and lots more. TheSusanSarandonSite continues to grow and i want to take this oppurtunity to thank visitors for taking the time to look around and signing the guestbook, which I love reading. This is only a fan site however, I am not and do not have any contact with Susan or her representatives unfortunately. 27th February - I apologise for the lack of updates recently. Recently went to London and i made sure that i got some pictures especially for the site. Obviously related to Susan. They are now added to the gallery. 15th November - Forum signatures added to the gallery for your use whenever and wherever you please to show your love of Susan and support to the site. They take a while to make but i'll do my best to keep adding more all the time. Coming soon - Avatars, wallpapers and forum signatures, so keep checking back. 29th October - More pictures added into the gallery. 28th October - Lots more trailers added to the multimedia section. Enjoy! 13th June - The all new more organised gallery is up. I will constantly be adding more pictures so keep checking back.